Have I tell you about 1984? Oh I have, many times it seems. How have we been? I would say we have our ups and downs, our disparities and commonness, but still till now we are as we are, always 1984. I’m sure you readers now have your hair standing, ha-ha. 1984 is the year we are all born in. It is the year of the Golden Rat, for the Chinese. All of us actually got together during our teens, when somehow we find commonness among ourselves. As my grandmother taught me long time ago when I was just a little kid, “birds of a feather, flock together”; I did not know then that this quote would apply to me personally as well as anywhere in this world (read the news and you know what I’m talking about) so well. But after we graduated from high school, we all started to grow different feathers, inevitably moving towards very different directions. Out of sentiments I guess, up till now, we are all still trying our very best to keep in touch, maybe once a while flock together. Walking down the road, she turned and stared at the distant. She shields her eyes from the glaring sun. She squinted to see it. She knew that it is there. After some time, her eyes adjusted, and she can see the beautiful house, seemingly shining among the sky. Her eyes watered from the strained, yet she continues to stare. Giving a final look, she turned and went on her way. The road in front of her would be long. It would be certainly different from the comfort life in the house. But she knew she had to move on. She had to walk this path, in order to fulfill her destiny. It is inevitably part of her life’s scheme. But yet she knew the life she once had in the house will always be in her heart. As she moved along the road, her perspective of it seemed to change. When she left the house, the road seems narrow, rocky and steep. It seemed really hard to tread it. Yet now as days go by, the road seems bigger, wider, leveled and smoother. Her feet, once dragging on had begun to start walking. As she walked on, it started to skip along. The road now seems very enjoyable. As she was walking down the road, the house is still in sight right behind her. It is always there for if ever once, she stumbled and fell, and she can always turn back and see that support is there, just within reach. Once a while, she did tripped and she did fumbled on the rocks on the road. And every time, with knees and hands on the floor she would look back and be reassured by the sight of the house and then with renewed strength, she would once again stand up and resumed her walk. As days goes by, she learnt to skip the rocks, she learn to look for holes and she learn to tread with care. She had found walking the road so much easier. Along the way, she found more things to do, other sights to behold, flowers to be picked, sceneries to be enjoyed and wonderful breeze to revel in. Thus, she was so caught up with all these pleasures in walking down the road, the house seemed like a distant fading picture. But soon she realizes something is missing. She enjoyed the sights. She loved the smell of the flowers. She stood in awe of the sceneries and she got swept away by the cooling breeze. Yet she knows she would not be here enjoying all these if it wasn’t for the house. So she stopped in her tracks; and once again turn back to look at the house, this time not for assurance, but just because. She smiled, as the house still stood looming there, shining before the bright sky. This time, the sun did not even seem to bother her. With the image in her mind, etched deep in her memories, she returns to continue down her path. This time, there is even more spring in her steps. Alright, now this post is getting a little heavy for a food blog. I thank you for your patience if you are still reading, so let’s move on to the food! Recently, one 1984 had a housewarming, and we decided to have steamboat along with a side dish (definitely my idea), which I volunteered to cook up ratatouille for them. Why ratatouille? Besides the fact that this dish had just won the hearts of many in the famed movie featuring the tham jiak Remy, it is also the fact that the movie had at one point of the show that I felt most compelling is the part where the once tried Remy’s ratatouille, the cynic Anton Ego was snapped right back to his childhood where he came home to a dish of ratatouille lovingly prepared by his mum. That scene got right to my heart. This is how the best food should be appreciated. This is how I had tried very hard to describe my Ah Ma’s cooking long time ago. This is how no matter where we go, how far we traveled, how many food we taste, it is always back to the basics, the most simple and humble dish churn out lovingly by someone especially for you. So this is why I chose ratatouille, to churn out this dish with my heart for my fellow 1984s, after such a long time that we finally reconcile in a home, so that when many years down the road, if they ever taste one nice (let’s just assume mine is good now) ratatouille, they would be snapped back right to that night where all of us sat together at the table laughing and eating good food. Since I was privileged as a cook, I had my friend to do the grocery shopping for me. I had sent them the needed ingredients prior to this. Imagine, halfway between their shopping they called me up and ask me what the heck is zucchini? I laughed and told them to skip it then if they can’t find it. They also asked where to get rosemary (I was thinking of the vacuum-packed fresh ones), I tried to explain where to get it in Tesco but finally they end up buying me bottled dried rosemary. Then besides, they overlook the ingredient of canned tomato puree which is essential to this recipe. Oh well, I have to make do with what I have and improvise. Therefore I ration some of the fresh tomatoes out and made my own tomato puree. I found that do not need to simmer for 1 hour (as per original recipe) as I see that everything is well cooked and the eggplant is starting to turn black and soft. Maybe because I altered the amount of tomato puree, I’m not sure why though. So use your own judgment when you cook it. The recipes also states that it will develop taste overnight but we can’t wait eh, we are having party! It tastes great nevertheless, with convictions from my friends. Sauté the tomatoes till soft, adding in salt and sugar to taste. Smash the tomatoes while cooking it. Heat the oil in a heavy-bottomed or cast iron pan. Add the eggplant and cook until lightly browned. Remove and set aside. In the same pan, cook the onion (add more oil if necessary) until translucent. 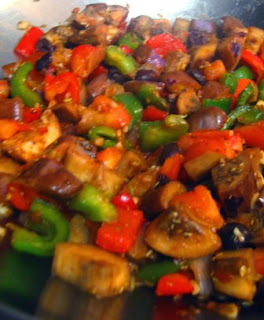 Add the red and green capsicums and cook until tender; add garlic, eggplant, zucchini, tomato and tomato puree. Cook for 1 minute. Sprinkle in the dried rosemary liberally as well. Then add in the olives. Season to taste with sugar and salt, but I find it unnecessary since my home-made tomato puree is already very well seasoned.